Bathrooms: 5 "Half Bathroom "
This stunning villa is located in one of the newest ocean front communities in Punta Cana, within the grounds of Arrecife gated community development. This resort style residential development is surrounded by P.B. Dye's first inland golf course in the Dominican Republic. The 5 bedroom beachfront villa sits in a privileged position with having both ocean views and views across the golf course. The property sits on just over a home lot of just over an acre and 2 master suites which overlook the ocean as does the family room and the gallery. The villa has been finished to the highest standard. 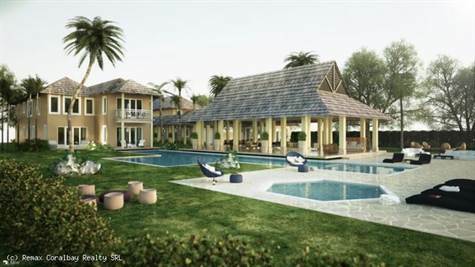 Other Caribbean villas within the Arrecife neighborhood range from a third of an acre to over one and a half acres in size. All homes are also conveniently situated near the pool, beach, and restaurants of La Cana Golf & Beach Club. This is your chance to own a piece of Dominican real estate! Contact us for more options available within this development.